When constructing business premises, we can create sophisticated individual solutions for the various premises needs of businesses, ranging from main office level premises to industrial installations. We carried out our first logistics projects between 2005 and 2008 in the Vantaa Aviapolis area near Helsinki-Vantaa Airport. In 2016 we constructed the Volvo head office and maintenance facilities in the area. 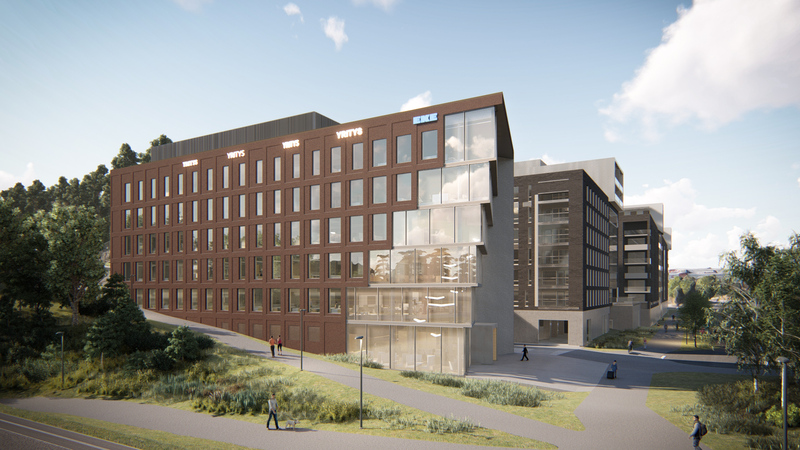 We will construct the Piispanportti office centre at Olari by the Länsiväylä motorway. In 2009, we constructed a business centre and business facilities with a floor space of approx. 80,000 square metres next to Pulkovo Airport in Russia. At Kirkkonummi, we are planning a workplace area for the Länsiväylä motorway area. There, we can construct high-quality business premises with a floor space of 40,000 square metres to satisfy our clients’ needs. We are planning the Länsiväylä workplace area at Kirkkonummi by the Länsiväylä motorway and the Kehä III national road. The 12-hectare area with an excellent location is owned by EKE-Rakennus Oy. Thanks to its excellent transport connections, the area is suitable for offices, stores, production and storage facilities and logistics centres. The Piispanportti office centre will provide an excellent location for companies hoping to benefit from the potential of the quickly growing office and service environment and its connections with the entire metropolitan area. The Vantaan Rasti plot, located in the Vantaa Aviapolis area, still has the construction rights of approx. 23,000 square metres of offices and industrial and storage operations. Let us know what type of business premises your company would like to have. We will construct the suitable premises according to your wishes. In 2009, we completed the Pulkovo Sky Business Centre next to the international airport of St. Petersburg in Russia. The total surface area of the site is approx. 80,000 square metres. The construction complex consists of three fourteen-floor towers and a parking space for approx. 900 vehicles. EKE has been in charge of the business centre’s operations since it was opened, and it is fully booked. We rent premises to the largest Russian companies, Gazprom and Sberbank . EKE Group builds entire residential areas, and our market area in Finland includes the metropolitan area and its surroundings. We aim to create safe, warm and village-like neighbourhoods that all the residents love. The apartments that we build are always well equipped and are built using high-quality materials. We pay particular attention to the functionality of the spaces. House management and service spaces are designed for the users, and there is enough of storage space. IBE Estonia constructs several residential areas of single-family homes near Tallinn, the broadest of which is Uuesalu, a residential area of 390 single-family homes. We have also completed residential areas of single-family homes in the Beberi and Marupe districts of Riga, Latvia. EKE-Construction Ltd constructs entire residential areas of single-family homes. Tightly-knit neighbourhoods consisting of housing associations provide safety, and they suit modern busy people. The areas are surrounded with plenty of nature and park-like recreation areas that the residents value. We carry out continuous research, listen to the residents and develop the areas accordingly. We support resident participation in different spare-time activities. In addition, we have interior decorators to develop the apartments according to the new residents’ desires. We want our apartments to be great places to live.